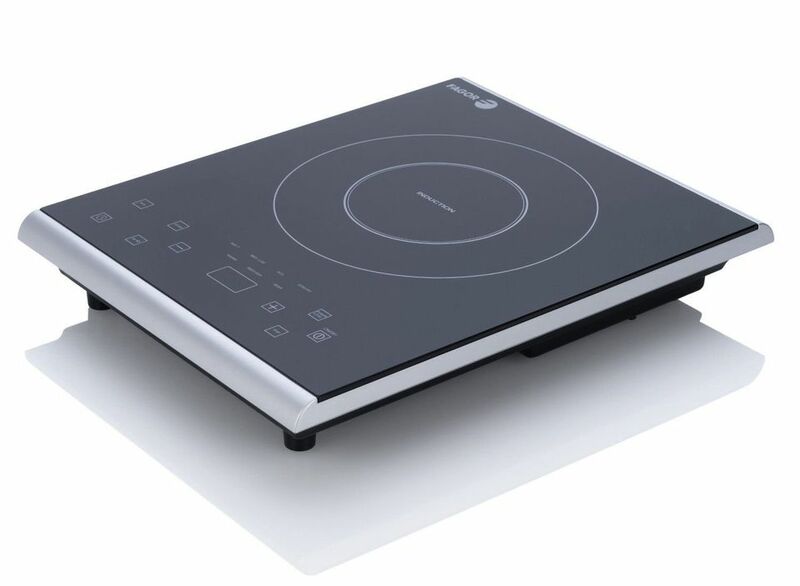 The Fagor Portable Induction Cooktop looks more like a pricey piece of computer equipment than something that belongs in a kitchen. Sleek, shiny and black, with brushed stainless trim, touchpad buttons, and a light-up display, it's a beautiful, modern countertop appliance. It's fun to use, as well. Induction cooking seems almost like magic – beneath that shiny surface are induction coils that generate magnetic fields that generate a warming reaction in iron-based pots and pans. The cooking surface itself doesn't get hot; instead, the food is heated from within the pot. In testing, we found the heat settings to be quite responsive; it was easy, for instance, to turn down the heat quickly while we were making a custard, to keep it from boiling. Proponents of induction cooking claim it's more efficient than regular cooking. Indeed, because the cooking surface itself doesn't generate heat, using the cooktop didn't heat up the kitchen as a stove might. But we also weren't wowed by the speedy cooking time we'd heard so much about. We did a boiling water comparison and found that the Fagor Induction Cooktop boiled 4 cups of water in our 2-quart saute pan in about 6 minutes. On our stove's large burner, we got a rolling boil of the same water and pan in 5 1/2 minutes; on the regular-sized burner, it took 6 1/2 minutes. Using this appliance, or any other induction cooktop, takes some getting used to. If you're accustomed to eyeing the flames to adjust a burner's heat level, it might take awhile to figure out how hot the six levels of heat settings actually get (It would be helpful if the manual gave an indication of what temperature each level corresponded to). What's more, the buttons require a specific firm touch that also requires some practice. This is for safety reasons; a child probably couldn't alter the controls (especially if the Child Lock is on), and also you can wipe up spills on the cooktop without accidentally changing the settings. It's important to note that not all cookware will work on induction cooktops. Because of the way the cooking process works, only ferrous metals (i.e. iron-based, magnetic) will work. Glass, aluminum and copper pots and pans will not work. Check the bottom of your pans with a refrigerator magnetic; if it sticks, it will work on an induction burner. The Fagor Portable Induction Cooktop sells for under $100. We can think of a number of ways in which it would come in handy, including in an RV; in the backyard; on a buffet or at the table; for a personal chef; for cooking demonstrations; or as an extra burner for holidays and parties. Measures 14 x 12 x 2.5 inches and weighs 7 lbs.